entered the "hospitality" workforce in New Orleans as a parking valet. dos and don'ts of tipping. An inside tell-all a la Bourdain's Kitchen Confidential. 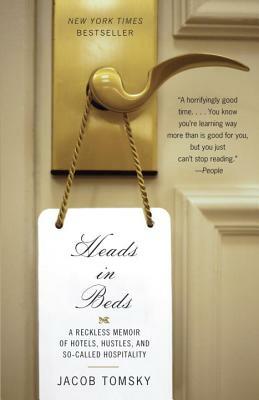 "Heads in Beds is Mr. Tomsky’s highly amusing guidebook to the dirty little secrets of the hospitality trade. But it is neither a meanspirited book nor a one-sided one.... [H]e winds up sounding like an essentially honest, decent guy. And his observations about character are keen, perhaps because he’s seen it all.... If this were simply a travel book of the news-you-can-use ilk, it would be of only minor interest. But Mr. Tomsky turns out to be an effervescent writer, with enough snark to make his stories sharp-edged but without the self-promoting smugness that sinks so many memoirs.... Heads in Beds embraces the full, novelistic breadth of hotel experience.... [Tomsky] is no longer a hotel employee and now, with good reason, thinks of himself as a writer."